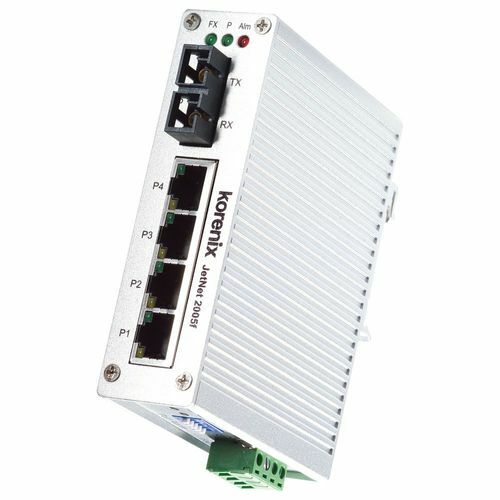 Korenix JetNet 2005f is an Industrial with 4 ports 10/100Base-TX and one 100Base-FX Fast Ethernet switch. With the fiber uplink function, it enlarges the transmission distance to 2KM by multi-mode fiber (JetNet 2005f-m) or 30KM by single-mode fiber (JetNet 2005f-s). 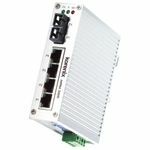 The JetNet 2005f adopts slim and rigid aluminum case to save rail space and provides good heat radiation ability for compact system requirement. In order to be operated in harsh environment, JetNet 2005f is equipped with IP31 grade case design to meet the requirements of drop-water and dust proof. 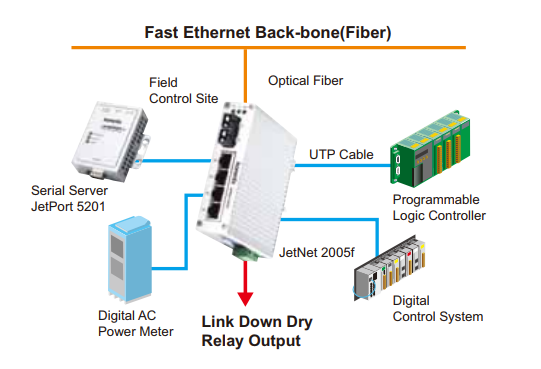 The JetNet 2005f also provides one relay output for port error events, which is enabled/ disabled by the DIP switch. Moreover, JetNet 2005f has good immunity against unstable power source and can accept DC 18~32V power input by terminal block. JetNet 2005f series requires no user setup and immediately starts operating as soon as you power it up. Excellent data transmission performance is provided for you. No traffic will be delayed with the transmission rate up to 3.2Gbps. The slim-sized design makes it an ideal model that would physically fit in a network environment with limited space. One relay output is an important feature to let you know when there is any event of port link down. Just move up the DIP switch, the fault relay alarm will be functioning! To avoid interference as well as to extend your network coverage, in addition to 4 Fast Ethernet copper ports, JetNet 2005f is equipped with one 100Mbps fiber uplink port. The fiber ports supports multi-mode fiber for 2KM or single-mode for 30KM distances, in order to achieve stable far-end transmission. 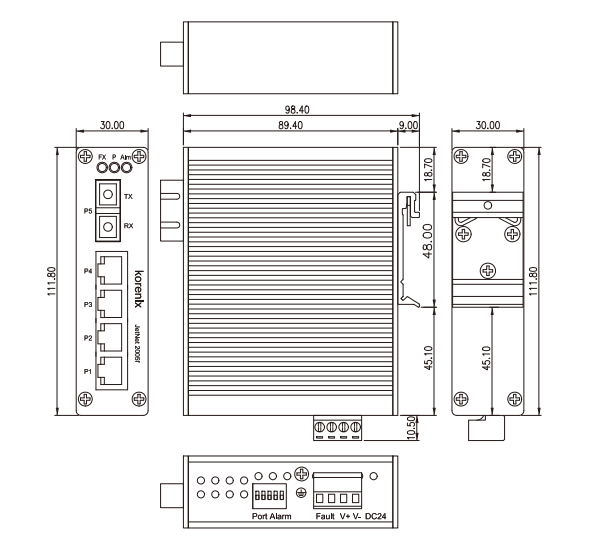 JetNet 2005f series can be easily wall mounted and mounted directly on DIN rail. The IP31 rigid aluminum flat casing and wide operating temperature range ensure reliable operation in harsh environments. Extended operating temperature range is available for project-based request.